New Profiles in History Catalog available online. 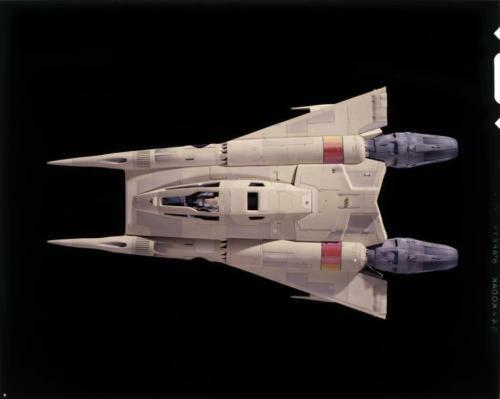 It appears that they sold some original Buck Rogers (and Battlestar Galactica) Miniature Props from Gary Cannavo's personal collection. Great source for photo reference for anyone wanting to build a replica. This little blaster is seen almost primarily throughout the second half the first season. I have not seen any official names for any of the pistols used throughout the series. Some of the guns/pistols that where used in Buck Rogers where also used in Battlestar Galactica. 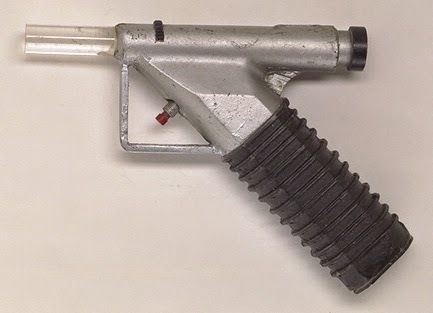 The base of this particular pistol was made from a Match-O-Matic butane gas lighter. It is shaped as a mini pistol which was a perfect starting point. The trigger and trigger guard were both removed and replaced with a new one that is more squared off. The barrel was unscrewed and removed as well. The wood sticker on the handle was most likely also removed and ribs where added down the handle then painted black. 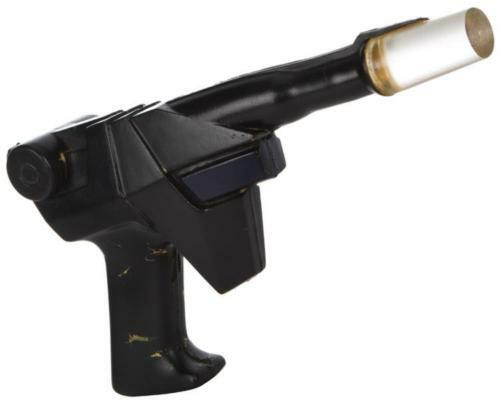 A clear acrylic tube was added for the barrel, so when the new push button was pressed by the actor, a bulb was lit for simulate the gun shooting. A clear holster with a leather belt strap was also made for the blaster. The blaster was used by Buck, Wilma, and several Directorate personal, as well as some villains. Once the master pistol was built, it was then molded and cast hollow to accommodate the electronics of the pistol. While the Match-O-Matic is originally chrome, all pistols in the show are painted silver. Below are some pistols that reside in personal collections, who shared their photos online.